We live in a mobile world – indeed you may be reading this on your phone or tablet device. But what if I now offered to call you on that very same device? The chances are you would prefer it if I did not. You’d more likely want me to send you an email. Research is increasingly showing that we are now dividing our communications equipment and methods into categories. Categorisation is a natural thing we do to help us make sense of the world. When we only had the ability to write letters and send phone calls we couldn’t easily divide up different kinds of communication. Now with phones, text messaging, Twitter, Facebook. Instagram and email we can decide to use each particular method for one specific kind of communication. For instance, many people now believe email is for business communications, Facebook is for chatting to friends and text messaging is for family. You will probably have similar divisions between the different communications methods you use. 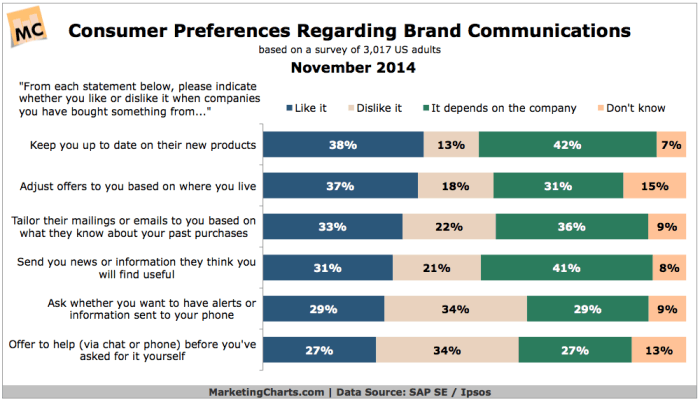 Now a new study shows this happening in terms of how people want brands to communicate with them. The research shows that the most disliked kind of communication from brands is when they offer or actually do send material to our mobile phones. We are quite happy to have the companies update us via email, but we clearly believe our mobile phones are much more personal. We don’t want any random person calling us or sending us text messages. There is a huge wave of advice on how businesses can market to their customers using telephones and how the mobile revolution will mean that handheld devices are going to be the most important tool for brands to keep in touch with their customers. But that is all based on the theory that we are all switching from desktops to mobiles. The evidence is much more complex. Indeed, it seems we are not switching but using mobile devices in addition to our desktops – again we are dividing up what we do with each piece of technology into categories that make sense to us. The chances are you have a desktop, a laptop, a tablet and a smartphone. You haven’t ditched anything – just changed what you do with each device. What this new study suggests – once again – is that email is the number one way of communicating with your customers. Indeed, they prefer that. They are even generally happy to receive well-targeted offers via email. But try and contact them on their phone, which they deem to be their personal territory, and you are likely to find their feelings about your business become more negative. The mobile device may not be the fantastic answer to marketing it is assumed.